When it comes to fall fashion, the most irresistible outfits are driven by a strong color palette. Hues can set the mood and allow your look to take on a personality of its own. Has a simple dress ever made you do a double take? It would in the perfect shade of ceylon yellow—that’s what we’re talking about. This season, earthy hues, high-contrast primary colors, cozy neutrals, and bold brights are the palettes we're most excited about. Pantone (the color authority) is forecasting that these trends will be everywhere this fall, and we can attest. Below, explore five stylish colors—and color combinations—that will give your wardrobe an edge this season. This close cousin of neon yellow lets you test-run vibrant hues, even if you’re used to tamer colors. It’s both muted and bright, packing a punch without being overpowering. Try it as a twist-front top or printed midi dress—both winning looks at the office and happy hour—a cozy cropped sweater, or an accent clutch. We like to think of oatmeal as the “effortless neutral.” This rich shade works well in transitional separates and looks especially good in knits and suede. Add this go-to hue for a cozy-chic vibe. Try it in a ribbed wrap sweater, a minimalist silk skirt, or accessories like detailed booties and a leather tote. This pastel reemerges frequently for fall—and it’s not hard to see why. Incorporating a single piece is one way to do it, but a head-to-toe look really makes an on-trend statement. When styling a monochromatic outfit in lilac (or any color, for that matter), add textured pieces to prevent the look from falling flat. Opt for a glitter-trim tee, brushed suede mule, preppy cropped pant, or oversized blazer. A modern bag makes a (very) pretty finishing touch. If you only try one new color trend this season, let it be brown. 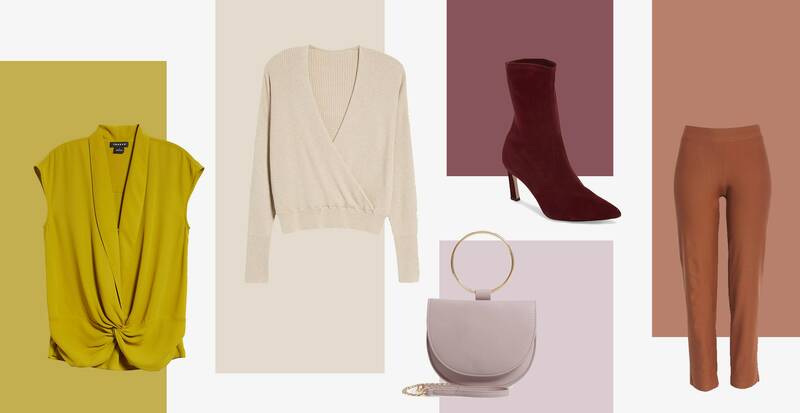 The “it” neutral for fall complements so many color palettes, that adding just a few strategic separates to your closet will give you a base to create dozens of outfits. Try it in everything from toasty umber to deep chocolate. We’ve paired it here with quetzal green, a deep emerald-blue also making the rounds this fall. A vibrant color paired with a more muted hue can balance out your look. Navy and red look perfectly on-point, whether you opt for a preppy Americana style or something bold and modern. Pair this combination in a single garment, like a striped pant or logo sweatshirt, or wear it separately: try a navy moto jacket with a cabernet red bootie.